The Parsons Green Fair had been a Fulham tradition for 25 years until 2015 . Now returning with renewed vigour, the Fair attracts local residents and London-wide visitors for a family day out that includes crafts, trade and charity stalls, local amenity groups, children's carousels and rides, bouncy castle, swing boats, trampoline and donkey rides. 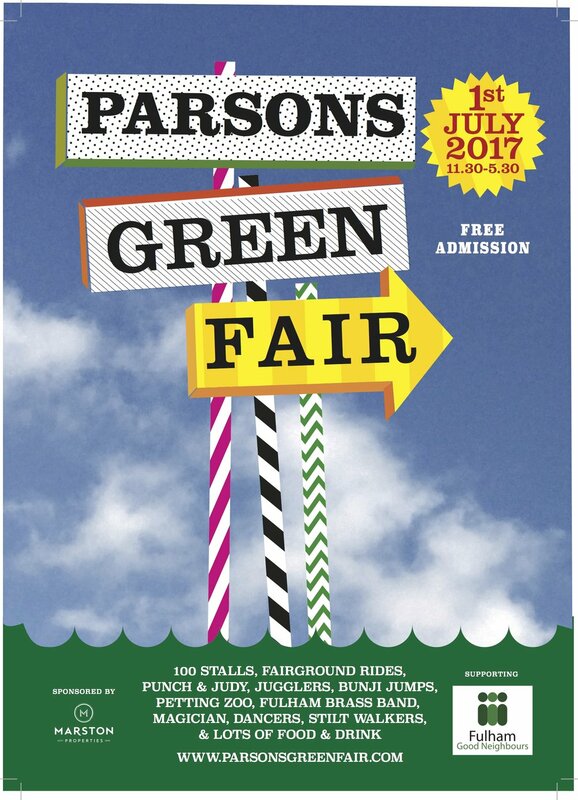 This year’s event is organised by Fulham Good Neighbours and sponsored by Marston Properties Ltd and will take place on Saturday, 1st July 2017. The event will be officially opened at 11:30 by the Mayor of LBHF Michael Cartwright and Greg Hands MP for Fulham and Chelsea. There will be over 100 stalls and attractions expected to participate with numerous local restaurants providing food and drink outlets with mouth -watering menus. There will also be two stages offering live music and performances to make the perfect accompaniment for a day out, right in the heart of Fulham.